Daesh terrorists opened fire on Turkish soldiers as they carried out detection and minesweeping in Karkamış town of the southeastern Turkish province of Gaziantep. Meanwhile, two mortars hit the town, one of which fell near the municipality building while the other fell near the gendarmerie station. There were no reports of casualties. Security measures were ramped up and Karkamış town was temporarily evacuated. Daesh terrorists opened fire on Turkish soldiers as they carried out detection and minesweeping in Karkamış town of the southeastern Turkish province of Gaziantep. Turkish soldiers return fire after being fired on from Daesh-controlled territory of Syria. Citizens were warned not to get close to the border region. Daesh attempts of attack was followed by the reprisal of the Turkish troops. Hostile fire was opened on Turkish military units near Karkamış border crossing in Gaziantep province on the Syrian border, it was reported. The border unit was involved in mine-sweeping near the border gate when they were fired upon from Syrian territory. The fire was reported to have been opened from Daesh-held Jarablus in the northern province of Aleppo. The hostile attempt provoked the military to respond with heavy fire. Turkish soldiers have responded to the direct threat with the same size, in line with rules of engagement. Military sources said Daesh terrorists fled from the border area after they were subjected to the determined stance of the Turkish military. Police stepped up security in Karkamış town in the aftermath of exchange of fire between the military and Daesh. Military warned residents living in border areas to stay away from the border line security reasons. Turkey had begun to remove land mines which were planted by Daesh along a strip of territory near a Syrian border town last month. 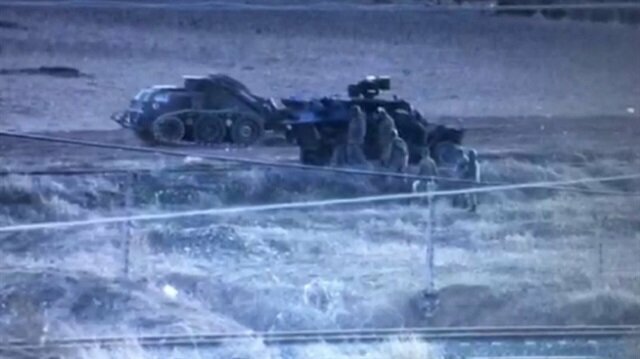 A mine sweeper was deployed in Karkamis town, Gaziantep, two weeks ago to remove landmines placed along the Turkish-Syrian border near Jarabulus. Turkish forces took wide-ranging measures in the town to respond to any hostile attack. Emergency crews and ambulances were sent to the border area in the event of any injuries that might occur during the de-mining efforts. 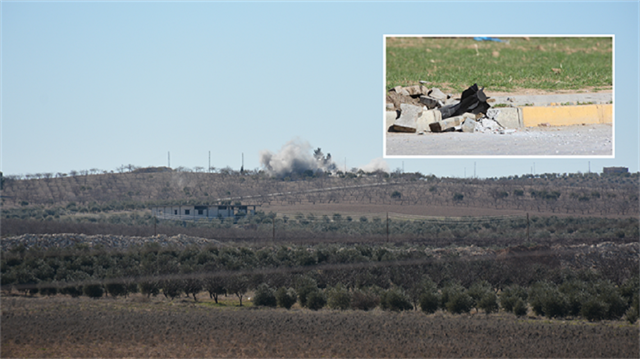 In January, Turkish artillery and tanks shot at the terrorists and killed five of them after Daesh opened fire from Jarabulus on the Syrian side during Turkish soldiers' demining on the border. Daesh terrorists opened fire on Turkish soldiers as they carried out detection and minesweeping in Karkamış town of the southeastern Turkish province of Gaziantep. Meanwhile, two mortars hit the town, one of which fell near the municipality building while the other fell near the gendarmerie station.